Red Sea coral reefs and colorful marine life at Coral Beach near Eilat, Israel. What makes Eilat and the Red Sea such a unique marine habitat and diver’s paradise? Start off with great weather and year around sunshine, crystal clear waters due to the Red Sea’s minimal turbulence, and add the abundant influx of plankton from the Indian Ocean. Add, easy accessibility and you have a sea-life lovers paradise for all ages, including small kids! 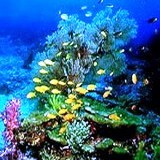 Ask Zack Shavin about including Eilat’s, Coral Beach and Coral World in your Israel tour program. DAY 1 Red Sea Eilat diving center, breakfast, equipment check. 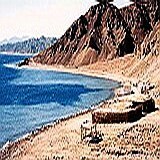 Depart to Taba border and cross into Sinai. Drive along Red Sea coast to Nueiba for our first dive. Overnight Dahab. DAY 2 Sunrise hike, breakfast, first dive at Common Market, lunch, snorkel at Blue Hole, second dive at Abu Hillel. Overnight under stars with Bedouin dinner. DAY 3 Swim at Mangroves, two dives at Ras Tantur, north to Dahab to eat and sleep in Bedouin village. DAY 4 Load equipment on camels and ride along the Sinai Red Sea coast to sites unreachable by jeep. First dive at magnificent “Gaber-el-Bint” reef, fish lunch, second dive, return to Dahab by camel for overnight. DAY 5 Sunrise dive at Canyon, 2nd dive at Rick’s Reef, rich in corals and sea life, lunch, relax, return to Eilat. Need more information about Red Sea Diving in Eilat & Sinai? Want to know how best to incorporate into your Israel or Holy Land tour? Ask Zack Shavin– veteran guide on the ground here in Israel.